Leicestershire celebrated their first away victory in the County Championship for four years when they won for the second time this season despite a defiant century from Derbyshire opener Wayne Madsen. The South African made 109 but highly promising fast bowler Nathan Buck took 3 for 35 and former Derbyshire seamer Andrew Harris also collected three wickets as Leicestershire dismissed the home side for 199 to win by 203 runs with 11.2 overs to spare. Leicestershire won only two Championship matches last season but they now have a 100% record under the leadership of new captain Matthew Hoggard, who took two crucial wickets when Derbyshire looked capable of holding out for a draw. Derbyshire went into the final day needing a notional 390 runs to win but, with their prolific opening batsman Chris Rogers already out, it was a question of trying to bat out time. They could not have hoped for a better first session as Madsen and Paul Borrington denied the Leicestershire bowlers any success before lunch. Borrington faced 94 balls before he hit his first boundary but he did an excellent job for his team and had survived for 167 minutes before he was lbw playing across the line at Hoggard. Leicestershire were convinced they had Madsen caught behind on 71 four balls later, but Hoggard did strike again when Garry Park edged to slip. Hoggard had taken two for 21 in an eight-over post lunch spell but Greg Smith helped Madsen use up 12 more overs until Harris revived his team's hopes. He had struggled with his line but he got one through Smith's defences in the 64th over and then tempted Dan Redfern to play at his first ball and edge a catch to the wicketkeeper. 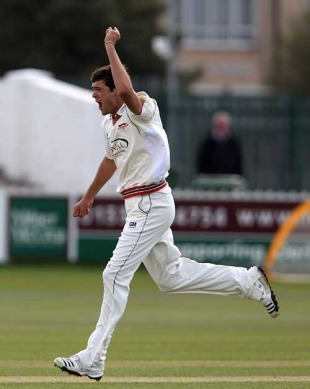 When Robin Peterson skied a sweep at Claude Henderson to deep square leg, Derbyshire had lost three wickets for one run in three overs and Leicestershire should have snared another when Lee Goddard was dropped at silly point in the last over before tea. Derbyshire had to survive 34 overs in the final session but Goddard went in the second of them, bowled off stump for a duck as he stretched forward to Henderson. Madsen, who spent 11 overs on 89, reached his first hundred at Derby off 214 balls and was steering his side towards safety when Buck landed a double blow with 17 overs remaining. The teenager got the wicket Leicestershire needed when Madsen was caught at short leg off bat and pad after battling away for two minutes short of five-and-a-half hours, and two balls later Steffan Jones edged low to first slip. Two Derbyshire old boys then sealed victory when Tim Groenewald, having occupied 63 balls in making 12, edged Harris low to Wayne White at third slip to give Leicestershire a 21-point haul and Hoggard another memorable day in his new career at Grace Road.